The new AFG 1.0 AT folding treadmill offers basic features on the console, a 10% incline, and a hydraulic lift assist for $1,099. The easy to read display is an LED brickyard with two 4-digit LEDs readouts for time, distance, calories, speed, incline, and heart rate. 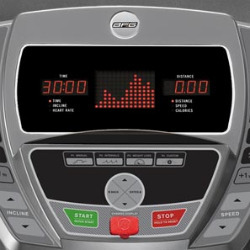 The four programs included Intervals, Weight Loss, and Custom. UPDATE: The AFG 1.0 AT treadmill has been discontinued. You can take a look at all of the most popular models for sale here to compare specs and prices. The AFG 1.0 AT folding treadmill has a 1.6mm belt, standard cushioning, a good size running area, 10mph top speed, 10% incline, 2.25-chp motor, and contact heart rate sensors on the handlebars. 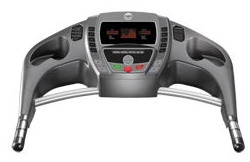 One cool little feature is that the console will remind you every 6 months or 150 miles to lubricate the treadmill. On the downside, the isn’t much of a program selection, there’s no audio system, and it does not have the AFG ProFILE™ tracking feature found on the more expensive models. You won’t find many reviews on these folding models from AFG due to its relative newness in the market and lack of popularity among the buying public. 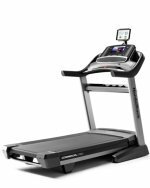 Treadmill pros give the AFG 1.0 AT average scores for power, reliability, and warranty, and above average marks for noise level and overall value. If you can find it on sale for less than its regular $1099 asking price, the AFG 1.0 AT folding treadmill looks like a decent choice. 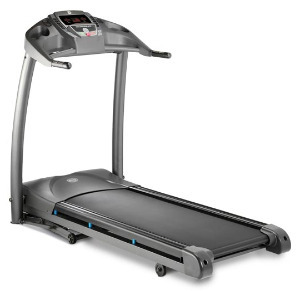 Since AFG is part of Johnson Health Tech, and bases its design on Horizon models, you should expect a similar type of treadmill. However, if you want to be one of the first customers to see how the machine and customer service shapes up, that’s your choice. If you don’t want to be a guinea pig for this brand, you can go with one of the proven treadmills offered by Johnson, including Horizon and Vision models.